I live in a cottage in East Yorkshire, right on Sunk Island – a huge area of farmland reclaimed from the sea. It’s pretty, and it’s flat – ideal for running. I started running on 8th January 2013. I started couch 2 5K. I had been curious about my friends who enjoyed running for some time, and rather fancied the simplicity of it. I have always hated exercise, partly because everything I had done since leaving school was dance / aerobics based and I’m laughably un-coordinated. I wanted to lose weight (I am currently a size 16) because I had been through a string of health problems (anxiety and depression leading to a full breakdown; ME/CFS; gall stones; gestational diabetes; a scan that discovered I only had one working kidney.) I realized that, if I wanted any quality of life, I needed to change my habits. That said, I had absolutely no confidence that I would succeed with running. The idea was preposterous. So I started running in secret. No. I was always the last to be picked at school, almost last in cross country. At the age of 12 I realized it was cooler to not try than to try and fail, so sport stopped being something I participated in. Love – there is so much to love! I love the sense of freedom when you are out in the countryside, watching nature. My mind settles into a calm rhythm. Sometimes my mind is active and I have a good think, sometimes my mind is just blank. 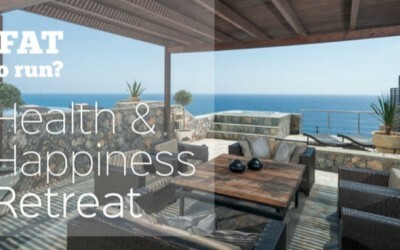 I love setting and meeting goals, and learning new things about myself. I love the feel of my developing muscles under my skin, where once there was only soft flesh. I love the people running has brought into my life, and the nurturing support they give. I love how I feel after I’ve run, especially when I’ve had a shower and I’m wearing compression socks. My friend calls it ‘smagony’ – smug agony. She’s not wrong. Mostly, however, I love that I have been able to make myself succeed in sport – I always believed it was not for me. If I can do that, what else is possible? 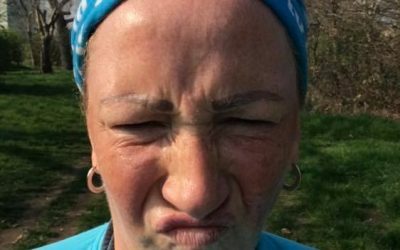 Hate – finding the right running shoes. I have really wide feet and still haven’t got this cracked. Sometimes I can end up with 14 blisters. I also have Morton’s Neuroma on my left foot and Plantar Fasciitis on the right – ouch. I get terrible nerves before long runs when I’m marathon training. They say the battle is mostly psychological, and this rings true for me. It’s hard to put your all into something when you know that, most likely, you’ll come last. It’s even harder when you know some people think you shouldn’t even be there. I do it because, if I don’t, who will? Us slower runners need to participate in order to normalize plus sized running. Sometimes you just have to wear your big girl pants and face it out directly. How often do you run? What kind of distances do you run in training? I try to run three times a week – 5k at Parkrun, 5k at my running club and a long slow run – I’m currently up to 18 miles and will peak at 20. 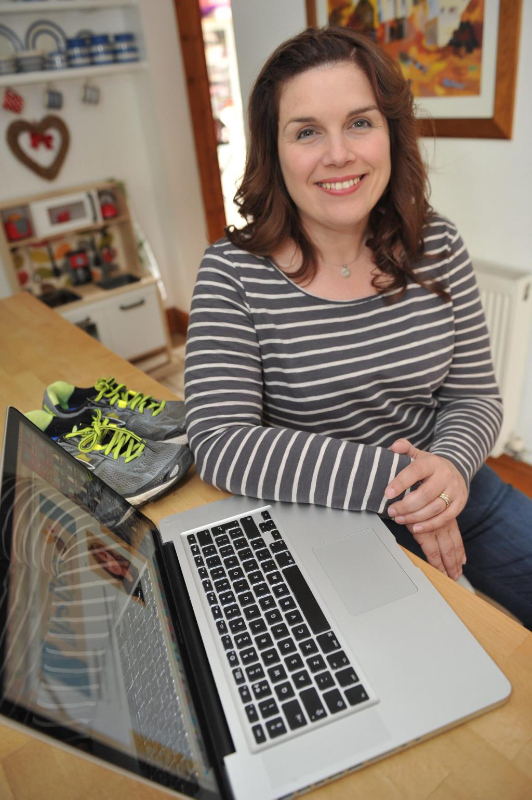 I run at the Hull East Park parkrun and I love my parkrun family – there are around 500 runners. I love to see the faces of dog walkers who don’t know about parkrun when 500 fluorescent, lycra-clad runners stream by. Yes, my husband and I do lots of racing. This year we have bought the season ticket to the Jane Tomlinson series – 4 x 10ks, 2 x half marathons and 1 x full marathon. We’re also running the Hull Marathon on 13th September. My first race was the Jane Tomlinson Hull 10K in May 2013 – I was terrified. I started sprinting when I saw the 800m to the finish sign, as I was delighted that I was close to the end. I had no idea that 800m is twice around an athletics track! I hadn’t walked for the entire race and was determined that I wouldn’t start walking when the finish line was in sight. I nearly collapsed over the line! I’ve never made that mistake again. Very few. I once took place in a 10K race held by a local running club. I finished last. They posted a video on YouTube, and the two marshalls were moaning to each other about having to wait for me. I felt so humiliated. 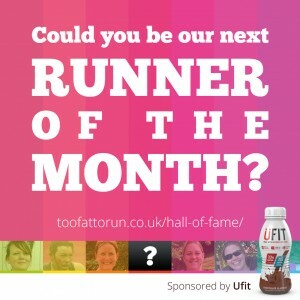 What are your biggest fears or concerns about being a plus sized runner? I worry that I am not taken as seriously as faster runners. I have recently challenged our local marathon about their inclusivity as they retrospectively imposed a six hour limit after I signed up. I believe there is a glass ceiling as far as marathons are concerned. 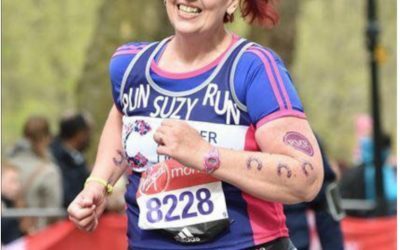 It’s OK for plus sized runners to take part in 10Ks, or charity runs, or walking marathons, or Race For Life – the jolly charity fundraising image of the plus size runner is acceptable. But serious plus sized runners? No. A newspaper comment I recently read said “it is an insult to athletes to call plus sized runners athletes” and there are plenty who think like this. It’s simply discrimination and we should face it down whenever we encounter it. Exercise is a good for fat bodies as it is for thin ones. If you run, you are a runner. 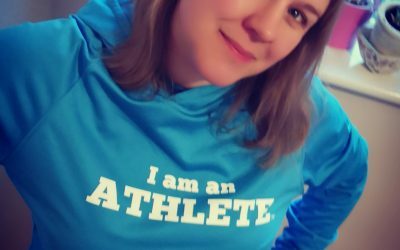 I know there are a lot of people who judge plus sized runners as not taking the sport seriously enough – or assume that if you are a plus sized runner you must be wanting to lose weight. I may have an extra layer of padding, but I have run a marathon and I can run more. Yes, it might take me close to 7 hours, but I still deserve to be taken seriously. A 14 minute mile is as far as a 9 minute mile, and marathons are about endurance. I recently received a message from a faster runner who said that, at my speed, I should have asked the Race Director for personal permission to run the marathon – despite no time limit being advertised. He argued that I should just run more frequently and train harder like the faster runners. I asked him whatever gave him the impression that I didn’t run 3 or 4 times a week, and didn’t give my all to my training? It’s a misconception. It might be easier for faster runners to run at 12 minute miles, but it’s hard for me and I give as much effort as they do. I also get really fed up with non-runners worrying about my knees! What is your ultimate running goal and what’s stopping you from getting there? I’d also like to run a sub 30 5K, but at the moment I have some gynecological problems and am awaiting a hysterectomy. A combination of the conditions themselves, and the medications (e.g. I am taking beta blockers that slow your heart rate, to combat the migraine side effect caused by another medication I need) means that my pace has slowed. I’m trying to be OK with this – I’m determined not to give up, above all else. I’ve never been very fast, but I do think I’ve been treated less well as I have slowed down. I think running clubs need to find more diverse ways of engaging plus sized women and this needs to have an element of confidence building integral to the running support. 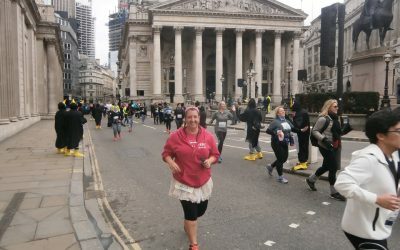 Plenty of running groups start with 1mile or 5k as the starting group – there’s no way I would have joined a group like this when I started as it took me a long time to be confident that I could run that far. We need more walking / run walking / couch 2 5K groups to encourage women to try running for the first time. There also needs to be a clearer route to further distances. I have known lots of women complete Couch 2 5K because they like the structure of the sessions, but then stop running once they are left to their own devices. If we are producing women who can run 5K, we need to continue providing the same sort of support to help them achieve longer distances. I’m currently trying Jeff Galloway’s Run-Walk-Run and have found my pace has improved! It really reminds me of Couch 2 5 K and I think we should encourage C25K graduates to have a look at it. We need to develop a culture where adults can set their own goals – I have been told that I need to be “more realistic” and improve my 10K speed before progressing to marathon distance. This was after I had completed a marathon! Why should these events only be for faster runners? Distance running is about endurance, and that has nothing to do with my size! Confidence is a huge barrier. It would make a difference if we could easily buy pretty running kit! If you look good, you feel good. I don’t want to look like a sausage bursting out of its skin, thank you very much. The dearth of role models impacts not only plus sized women, but other runners who see us as an oddity. Another barrier that is common to all women, not just plus sized ones, is how busy our lives are. Women tend to take on more than their fair share of childcare, work, household management and so on. I think we would all benefit from running women sharing how they manage to fit exercise into their daily lives. For example, when I’m doing a long run, I sometimes split it into two runs on the same day, so I can fit in the school run, for example. Or I put the toddler to bed and go out and run until its dark – or I run to running club, do a run there and run home again (its 6 miles each way, so this really adds up.) This might not be the way that Mo trains, but running on tired legs hasn’t done me any harm so far, and has allowed me to fit running in with my family responsibilities. What is the best bit of running advice you have ever been given? I use the mantra “I’m tough, I’m strong, I’m moving” when I’m starting to struggle. During my marathon I also visualised scooping down into myself to collect energy. This was a trick by Hal Higdon and it worked really well for me. Do you think runners are defined by the speed they run? Absolutely, and I think this is wrong. Running is not complicated; we make it so. It’s simply putting one foot in front of the other. One of the brilliant things about running is that, by its nature, its inclusive. You don’t need a lot of money or fancy kit or a gym membership; you can run as far as you want and as fast or slow as you want. Running clubs should accept that adults can set their own goals, and that it’s perfectly OK to work on distance before (or even without) speed. If we are to have a lifelong relationship with running, then it’s not possible to always get faster. PBs become harder to achieve – indeed, like me, you might get slower for a while. It doesn’t mean the end, though! We should accept that it’s OK to lace up your shoes and get out there regardless of the speed or distance. We should reward resilience, as well as speed. Exercise is beneficial however you take it. Do you think there has been an increase in profile for plus size fitness in the last 12 months? Yes, I think the #This Girl Can campaign has been instrumental in this. We still need to get the word out that fitness has as many advantages to the slower runner as it does the faster runner. How can we be telling people that they are personally responsible for their own obesity, yet excluding them from races they want to participate in? There is still plenty of work to be done, but we are making progress. It has given me the confidence that I do deserve to be a runner. 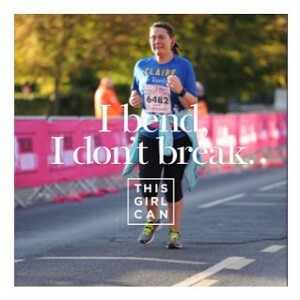 I feel strongly that we should point out discrimination whenever we see it and the Fat Girls Guide To Running has helped me feel that I can do this. Running should be about effort. It’s that simple. 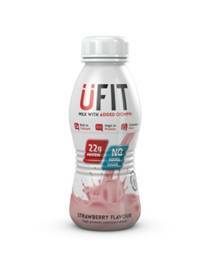 And finally, as part of our new partnership with the Protein Company we will be sending you some uFit protein drinks to help with your training. Have you used protein drinks before and how do you think you might get on with them? Yes, I picked up one of these little beauties after a long training run a couple of weeks ago, so looking forward to receiving some more to hell me in the lead up to my next big race.